Lancastrian experimental venture, made up of Sean Canty and Miles Whittaker. Demdike (aka Elizabeth Southern) was the ringleader of the Pendle Witches. Accused of three murders, she died in prison in 1622 before coming to trial. 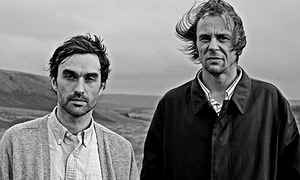 Demdike Stare, even their name conjures up images of the occult... The pair, based in Manchester, have the strange ability to create music that terrifies the very soul. Not confined by one genre, the duo produce a mixture of ambient & electronic, dubby drones & stripped down techno. Laced with sounds of echoing vocals, wailing screams, dark rattles and cult horror film samples, Demdike Stare's music is the soundtrack to a recurring nightmare. Standout tracks for me personally include the aptly titled Haxan Dub, beautifully scary Leptonic Matter and trance enducing Hashshashin Chant; which I imagine would be the perfect soundtrack to a cannibalistic satanic ritual.